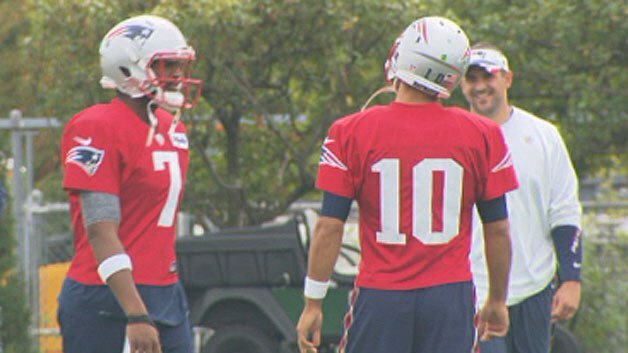 The #Patriots have perfect practice attendance, including QBs Jimmy Garoppolo (shoulder) and Jacoby Brissett (thumb). LET’S GO. I’m a little surprised at Jimmy G because that looked like a nasty injury the way he landed on his shoulder but nevertheless this just has me pumped for Sunday against the Bills. One last game before we get Tom back and the Patriots have a chance to go 4-0? 4-0? I don’t think ANYONE expected this at the start of season because of the uncertainty of how Garoppolo would perform under the pressure knowing he would have to go at least 4 games. Going into the season, I would’ve been satisfied with 2-2 under the circumstances. I bet even Tom sitting at home with Giselle on his lap couldn’t have even pictured this and even sweeter, neither would have Goodell. Jimmy performed well enough for the win against Arizona but my god in that next start against Miami? It speaks volumes about how confident and how cool the kid is to go out there in that situation and just flat out dominate. He went 16/26, threw for 232 yards and had three TD passes. The three TD passes he threw all came on the first three drives for New England. Just blistering stuff. But just as it was all going good he went down with a pretty serious shoulder injury and looked very unlikely to come back. He didn’t return and so the spotlight turned to rookie Jacoby Brissett who just a year ago was playing for NC State. We didn’t get to see much of him so it was tough to create an opinion. When it was announced that Garoppolo wouldn’t be available against Houston, I imagine Brissett felt the whole of the nation watching him. It wasn’t just going to test the mentality of young Brissett but also just how great of a coach Bill Belichick is. Could he get a third string rookie quarterback ready for his first ever start against one of the best defensive teams in the game? Never underestimate the powers that Belichick possesses. A forced fumble set the Patriots up at Houston’s 22 and Brissett came in looking to give his team the lead. You know how a quarterback likes to throw it? Yeah, the throwing game really ain’t Brissett’s style, he’s more into the running game. He ran 27 yards for his first career TD in his first career start. Magical moment. Instead of keeping the ball, he gave it to Belichick. I think that right there alone shows what kind of impact and influence has on his players, they don’t see him as a coach but more as a father figure. Brissett finished the night 11-19 with 103 yards for a memorable debut. I certainly wouldn’t want either of these two to get injured again but a tiny part of me wants to see Julian Edelman at QB. We’ve already seen him throw a TD pass against Baltimore in the play-offs but wouldn’t it be great if he could do it again. I mean come on, imagine this guy at QB?